Born in Wellwood, Frank McKinnon was an outstanding educator, administrator and sports executive. He played minor, junior, intermediate and college hockey in Brandon. He served 18 years as a member (five years as President) of the MAHA and five year as a member (three years as Chairman) of the CAHA. He was the 1983 winner of the Canadian Pacific Air Executive of the Year Canada. He was a Vice-President and Director of the Sports Federation of Canada, a Vice-President of the Canadian Olympic Association, a Congress member of the International Ice Hockey Federation and a Trustee of the Centennial Cup. 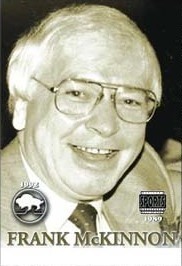 Frank McKinnon was also the Commissioner of the MJHL for many years.